Can Lawsuits Stop The EPA's Carbon Rules? 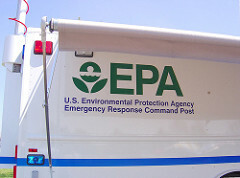 Quick recap: The EPA is moving ahead with its own regulations for greenhouse gases. (See this recent piece I did for a look at what those rules might look like.) The EPA isn't just doing this because it feels like it—back in 2007, the Supreme Court ruled that the agency was required to regulate carbon-dioxide and other heat-trapping gases under the Clean Air Act if it found that those gases posed a threat to health and public welfare. Last year, the agency reviewed the evidence and found that, as the bulk of scientific evidence suggests, yes, they do. Anyway, as expected, a bunch of industry and political groups—along with the state of Texas—recently sued the EPA, asking the courts to stop the regulations. Their rationale? The petitioners are arguing that the "Climategate" e-mails, along with the errors recently uncovered in the IPCC's 2007 report, undermine the science on which the EPA based its endangerment finding. The court would review the agency’s action under the Administrative Procedure Act’s “arbitrary and capricious” standard. In practice, this is similar to rational basis review. Agencies win unless they fail to provide any basis for their action or that basis is extraordinarily flawed. In the context of the endangerment finding and the science behind it, this is the right approach. The IPCC report and mainstream climate science in general are widely but not universally accepted. This is normal. Science is never perfect and even when there is “consensus” in a field it is not universal. This is true of all of the science on which regulatory agencies rely to support their regulation, not just climate science. Regulatory agencies are designed to be able to deal with this uncertainty and however imperfectly they may do so, there is no reason to think that a court would do any better and every reason to think that a court would probably do worse. The D.C. circuit simply isn’t equipped, either in terms of expertise or procedure, to pick winners in climate science debates. The arbitrary/capricious standard of review—which is specified by statute but in reality defined by courts themselves—reflects this. The result, in this and many similar cases in the past, is substantial deference to the agency. Unless the petitioners can show the EPA failed to support its conclusions at all, failed to consider some body of evidence, or engaged in some misconduct, the court will rule in the EPA’s favor. The petitioners have not alleged anything close to this. Now, that doesn't mean the EPA's greenhouse gas rules won't bump up against more significant legal challenges down the road. Industry groups almost certainly won't be able to challenge climate science in courts, but they can still challenge the specific rules that the agency devises. For instance, as I mentioned in my piece, the EPA wants certain rules to apply only to polluters that emit more than 25,000 tons of carbon-dioxide per year—but this "tailoring rule" may be vulnerable to a legal challenge. So this isn't the last lawsuit we're likely to see. Meanwhile, there's another entity that's working to stop the EPA—namely, Congress. Late on Friday night, eight coal-state Democrats, led by West Virginia's Jay Rockefeller, sent a letter to EPA head Lisa Jackson asking her to suspend regulations for coal-fired utilities and industrial facilities until Congress passes its own climate legislation. This is in addition to the 39 senators who are supporting Lisa Murkowski's bill to strip the EPA of its authority over greenhouse gases. That's not enough votes to stop the agency (especially since Murkowski's bill would likely have to overcome an Obama veto), but the push to stop the EPA does seem to be gaining momentum.